This can be made into one large tart for sharing, or individual serving tartlets. Serves 6. 1. Line one large or 6 individual tart tins with the sweet pastry, prick the base(s) with a fork and put in the fridge for about 10 mins. 2. Preheat oven to 200C / 180C fan oven / Gas 7. 3. Blind bake the pastry case(s) for 8 minutes with baking paper and beans, then remove the paper and beans and return to the oven for 5-7 minutes until golden and crisp. 4. Meanwhile put the apples and caster sugar in a saucepan, cover with a lid and cook over a low-medium heat, stirring occasionally for about 10 minutes until the apple is tender and juicy. Stir in the raspberries and cook for just a minute or so until they start to release their juices. Remove from the heat. 5. To make the crumble topping, rub together the butter, flour and cinnamon, until the mixture resembles coarse breadcrumbs. Mix in the brown sugar and almonds. 6. 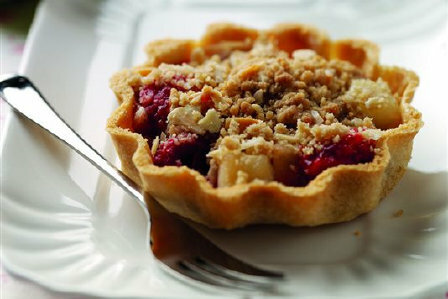 Spoon the apple and raspberries into the pastry case(s) then scatter the crumble over the top. Put in the oven and cook for 10 minutes until the filling is bubbling and the crumble is golden and crisp. 7. Serve warm or at room temperature with cream, crème fraiche or ice-cream.